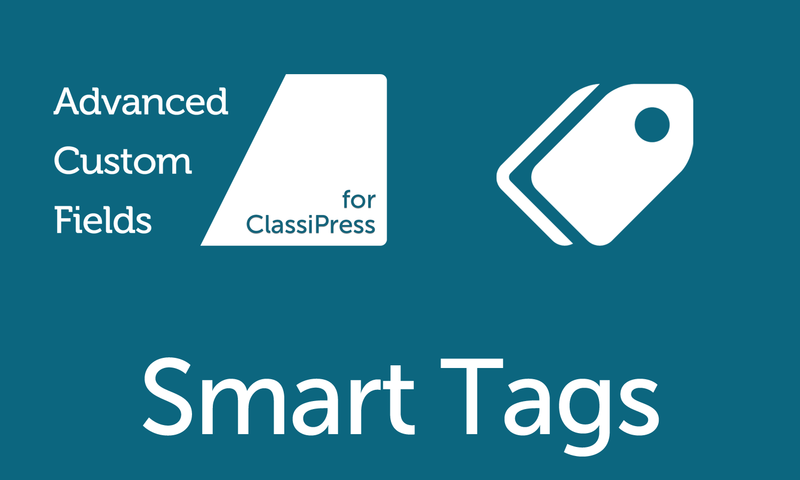 Make smarter use of the ad tags in ClassiPress with the The ACF :: Smart Tags plugin. The plugin will let you convert all multiple choice fields like drop-down, checkbox and radio into ad tags, so you only have relevant ad tags that you yourself have created in the form of field values. Also turning the right kind of fields into tags will give your site a big SEO advantage! When you have a free text input available that generates tags in your website, chances are that they are going to go out of hand one day. There is no limit to how many tags can a poster add, also they generally put long phrases, or do not use commas at all to separate tags, and nowadays people even put hashtags(! ), other common occurrences are misspellings, wrong suffixing (for example teacher/teaching) and synonyms (two words that mean the same thing). The result: within a short frame of time you could have hundreds of tags that will be used in at the most one ad, and even that number will become zero once the ad expires! The solution to this problem is simple. Remove the “Tags input” field from your form layouts, and use ACF :: Smart Tags instead to convert the multiple choice fields (i.e. drop-down, checkbox, radio) into ad tags. For example, if you have a tutor classifieds website, in which you have a drop-down or a radio field called “Preferred Time” with options “Morning” and “Evening”, you can convert it to ad tag using the plugin, and all the new ads will either be tagged “Morning” or “Evening”. Now the students looking for morning tuitions can click on the tag called “Morning” and see all the tutors available in the morning. In the same way, if there is a checkbox field with all the subjects as options, an ad can be tagged in multiple subjects when the tutor posts his ad and the result is each subject has its own tag page listing only the tutors that teach that particular subject. Simple, isn’t it? SEO friendly – each ad tag page will have relevant listings, hence you can proudly display your ad tags in widgets, menus, etc! Please read the FAQs carefully before making your purchase. Do I need to remove the “Tags Input” text field from my forms? Yes, the plugin will add its own tags, so the text field for tags will not work anyway. How do I remove the “Tags Input” text field? You can remove the field from ClassiPress -> Form Layouts page in WP admin dashboard. I have too many form layouts. Is there a quicker way of removing it? Yes, you can use our Advanced Custom Fields for ClassiPress (ACFCP) plugin to hide any field from all forms at once as long as it is not a required field. You can do much more with the plugin, click the link above to find out! Will this plugin automatically convert fields to tags on existing ads? Not until they are edited or re-listed. This will only affect the ads added, changed, or re-listed after the plugin is installed. I see more than one plugin with the “ACF” prefix, are they related? Yes. 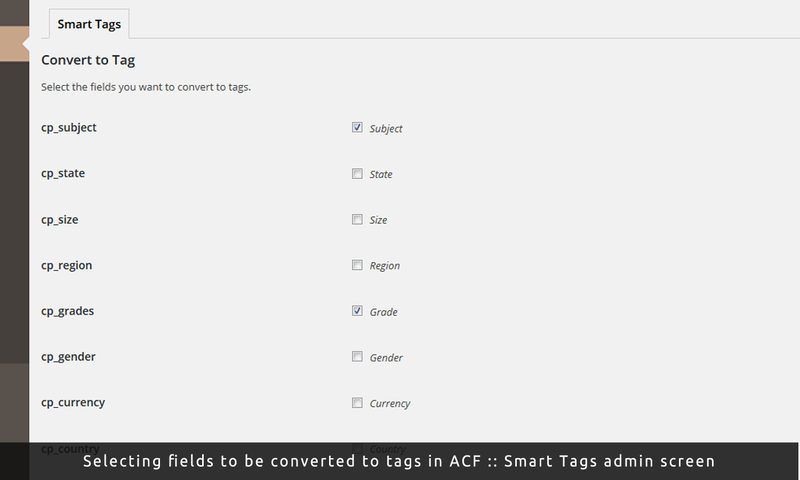 The ACF :: Smart Tags plugin is part of the ACF family of which the main plugin, Advanced Custom Fields for ClassiPress (ACFCP) allows you to add tie user profile fields up with ad custom fields by letting you add new fields to the registration/profile form where you can gather essential user data and have it saved into their ads. Basically you can inherit field options from ClassiPress custom fields directly into registration/profile forms, and in turn populate the Post Ad/Edit Ad forms with data from the user profile! Plus there are tons of options to control how the any profile or ad custom field works, and many display options for both. That’s not all, there are two more plugins in the family. ACF :: Privacy will let you conditionally display profile fields only for certain user roles and ACF :: Hyperlink will let you display any field as a link with custom content and attributes! So, does this plugin require ACFCP to work? Not at all! 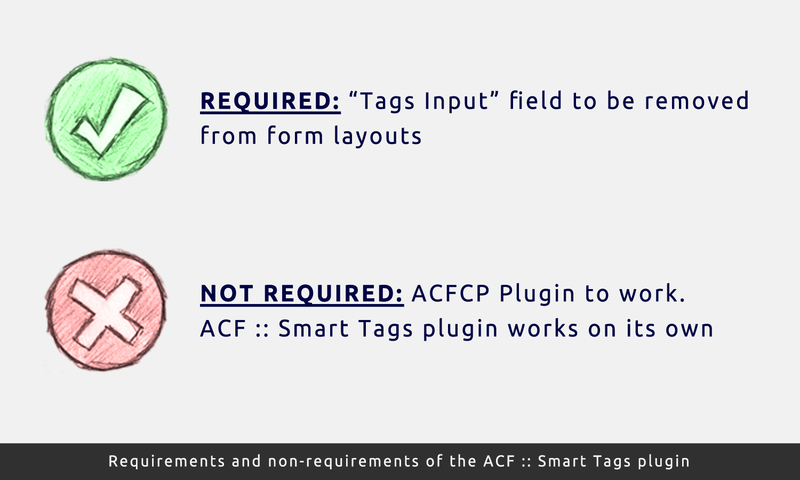 The ACF :: Smart Tags plugin does not require ACFCP but they work perfectly alongside complementing each other. However, to use ACF :: Privacy and ACF :: Hyperlink plugins, you need ACFCP pre-installed. Is it compatible ClassiPress versions older than 3.4? Yes, it works as far back as ClassiPress 3.2.1. But we do not encourage outdated software, and may not offer support if you are using a version of ClassiPress that is not current. Select the fields that you want to convert to tags. 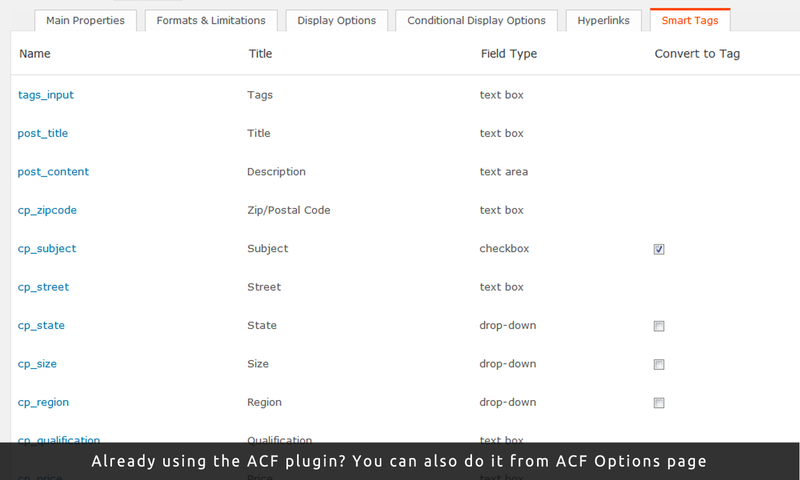 If you have the Advanced Custom Fields plugin installed, you can even manage your settings from ClassiPress -> ACF Options page -> Ad Fields tab -> Smart Tags sub-tab. I have to ask the question, can we not have something like this for Vantage sites..? Why it comes with only 1 year for updates ? How much should we pay for renewal? Where does it say only 1 year of updates?. 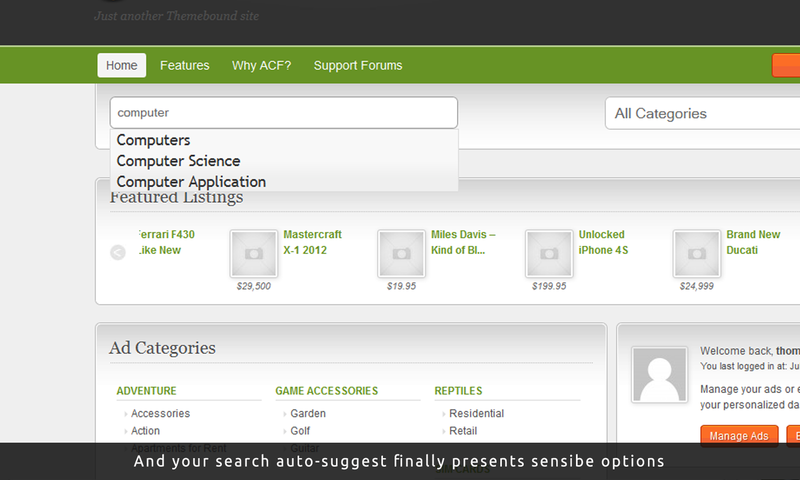 All marketplace items are on the same subscription model as the themes from AppThemes from this January. You will continue receiving lifetime support and updates on your past purchases, however for the future ones, you will have to renew at roughly 30% of the original price year on year. I have to update my ClassiPress 3.4.1 to 3.5.1. 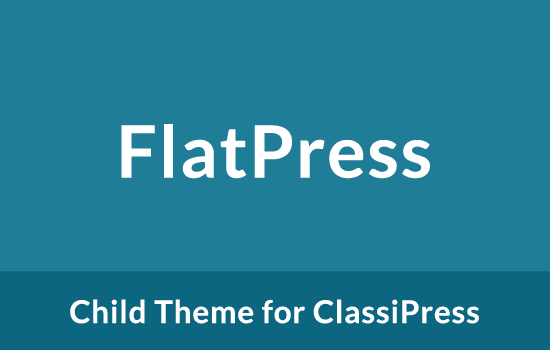 I have ACF :: Smart Tags your plugin, is it ready for the ClassiPress 3.5.1 ??? The plugin has no known issues with CP 3.5.1. I’m currently using Smart Tags on Classipress but would love this for JobRoller. Would you please consider releasing for JobRoller? Thanks for the interest. It depends, if we find the time then we might just go on and do it. Once the tags input field is removed, is it still possible to manually enter tags? 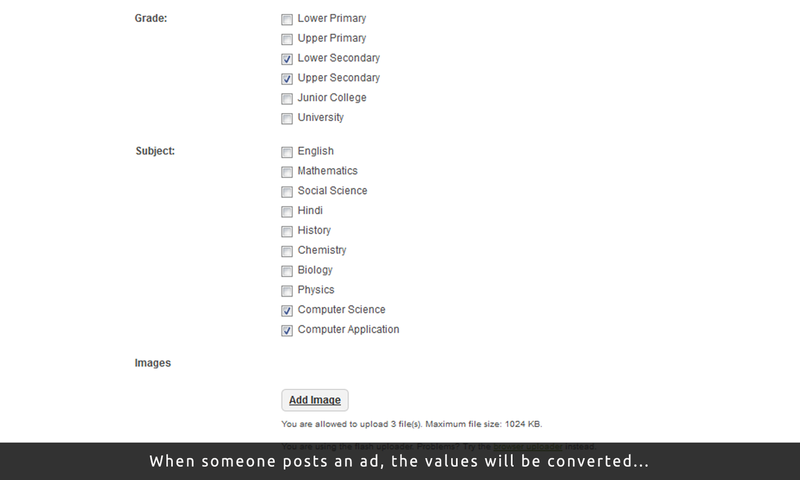 Each ad can easily have many related tags that are NOT appearing in any fields. So having the option of adding tags manually is CRUCIAL. By the way, can you tell me: what is the ideal number of tags per ad? (How many tags are allowed per ad before Google will consider this ad spam?). P.S. yesterday I purchased your ad scroller. I love it. While it’s easy to allow manual tags, the potential issue here is that when people edit ads, they would see both manual and auto-generated tags in the input box, if that is not a big trade off for you, you can get in touch via email with a support request once you have the plugin, and I can show you what to change. The plugin only adds tags on existing ads while they are being relisted/edited, so it won’t generate those tags instantly. Tell me how to configure the plugin . set activated . Results not. Please send us an email with your support request. You will find the email address under the support tab. It works with another language or only english? Thanks for the interest. The plugin can be translated into any language using the POT file that comes with it. However, it will still work without translating because it only adds strings to the admin back end, and on the front end it’s just options you create from custom fields section. Thank you Mohsin for your answer. I know that you can translate the plug through a file .pot, .po to .mo. I asked about whether the plug will recognize words in a language other than English. But my question was stupid. I didn’t read your description enough carefully. There, you write clearly: ‘you only have relevant ad tags that you yourself have created in the form of field values’, ‘since all the tags come from options that you have created’. I’m sorry, my foult. Its me again, a bad news. I have bought, install and quickly test your plugin. And I have to write my negativ review. Why in the plugin settings is not original fields? Such as title and content? Only then plug could generate interesting tags, by separating words from the title and content. And then it would be ‘smart’. My custom fields absolutely not suitable for tags. I am sure that 90% of owners of sites with classipress no appropriate custom fields for tags. It is absolutelly wrong idea. The title of your plug is misleading. I’m sorry but this is not ‘smart’ plugin, it’s primitive plugin. Absolutely useless. If possible, please refund. 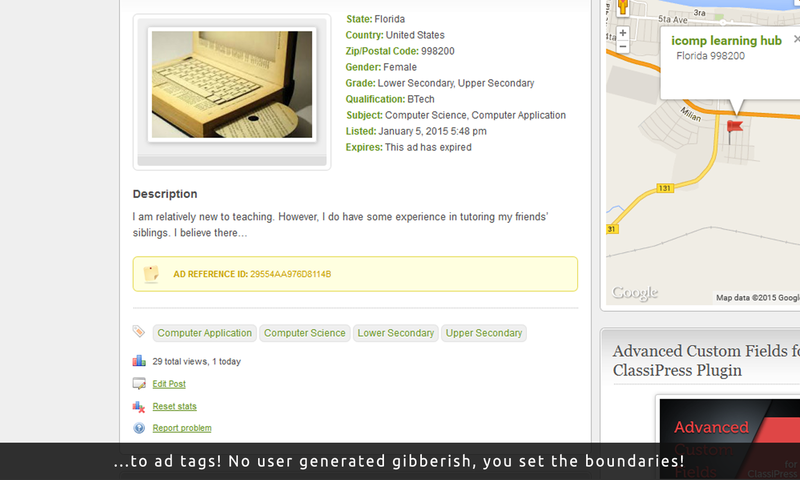 I am sorry the plugin works as it says in the description and not what you suddenly fancy. If as you say, your custom fields are not suitable for tags, you don’t buy it on a whim, just like when you’re grown up, you don’t buy kid size clothes. The plugin just does what it says, what’s the point in questioning what it doesn’t do? It is a perfectly good idea for dozens of other people, ‘smart’ as well. The wrong idea is when you buy something without reading or thinking about what you’re going to do with it. It is the year 2016. I thought that the ‘smart’ means something more than the simple generation of tags from custom fields. Okay, I did not read the description carefully. So, my english is not so good, my foult. I just thought that your plug is really smart and clever when called smart. Maybe you thought that you came up with a brilliant idea and why this name.. ? But I just say you: – this is not a brilliant idea and your plugin is not smart. So, I understand that you do not agree on refund. Okay Mohsin, take it. It your money. But please understand I’ll write a review. Not negative. Truly. It is the year 2016, so ‘smart’ surely doesn’t mean hiding behind excuses. You did clarify about “custom fields” before you bought it, and it is there in the previous comments. By the way your English is good enough, the way you’re trying to put all blame on me. Are you really having a debate on the usage of the word ‘smart’ when there is a lengthy description that tells you why it is supposed to be smart? If it isn’t smart, don’t buy. First, you buy something fully knowing what it does (as reflected by your pre-sales comments), but mis-judging on whether it is relevant to you. Then when you find that it wouldn’t work for you, you come out blasting the product instead of being polite in asking for a refund (although there is no case for it, I could have been swayed if you didn’t blame the product), and lecturing me on how the title is mis-leading based on the use of the word ‘smart’. Then, when your own mistake is being pointed out, you give an excuse of poor English while continuing to debate on the word ‘smart’ (see the irony?). May be your actions are what you call ‘smart’ then? P.S. English is not my first language either. Thanks for pointing out. It should be good now. I recently consolidated my tags from 50,000 to about 350. It was a ton of work and am glad to see there might be a solution to help automate this moving forward – and prevent users from misusing the tag feature. Before when I removed tag input field and if a user edited ad, it would remove all tags. Do you know if this is an issue with the plugin? Secondly do you know if there would be a way to make this work with my existing tags. Hardly any of my tags are the exact field name. IE. Say I have a hat website and I have a size field: Small, Medium, Large – but my current tags are ‘Small Hats’ ‘Medium Hats’ and ‘Large Hats’… Would I be able to make this work? Thanks, also checking out a few of your other plugins. Good work, keep it up! It can work with a few changes, but only if your custom field values exist inside the tag names just like your example. I’d like to try adding an ad to see how the plugins works during the listing purchase. Thanks for the interest. Unfortunately, there is no live demo available for the “ad posting” process. Could you post a screen of the “ad posting” process? The plugin works in the background after you click the submit button while posting an ad. The illustrative screen shots can be seen while going through the image slideshow at the top of the page. I bought this plugin and was dissatisfied. In DEMO shows several fields to customize, I installed the plugin and only gave options to customize cp_state, cp_region and cp_country. After reply I wanted to qualify 5 stars. I await contact. Please send your support request via email. Our email address is mentioned under the support tab. Hi does smart tags working with new 3.6.1 cp, and without acf? 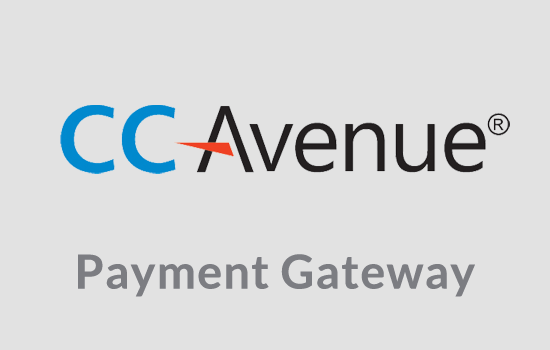 India's biggest payment gateway with 200+ payment options. Hide or replace fields from users based on role or membership pack.